This is the wrong question to be asking, however, in that it assumes a constant spread to exist in the first place. Our research on the drivers of asset pricing and cap rates demonstrates that no such long-term constant spread exists, so the question is moot. Instead, the spread to Treasurys varies, depending on a myriad of macroeconomic, capital markets, and real estate factors that determine asset prices (and consequently cap rates). The bottom line of this analysis is that there really is no constant long-run cap rate spread to Treasurys. The various factors that drive cap rates will cause this spread to vary across given points in time; the spreads will always be changing. 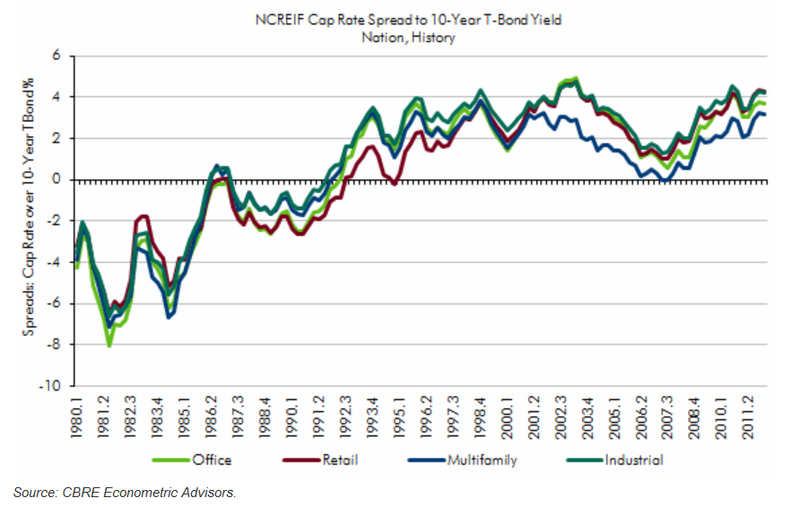 To see the effects of different drivers on cap rate spreads see the CBRE Econometrics report here: Cap Rates: What’s the Long-Term Spread to Treasurys? This conclusion does not imply that looking at these spreads will not prove insightful to an investor. On the contrary, spreads indicate the changes in relative pricing of real estate to a benchmark risk-free rate. What one must keep in mind, however, is that this spread will never be constant; rather, it will constantly be changing in response to changing macroeconomic and real estate market fundamentals. Rather than focusing on some constant spread, an investor must understand the various factors that affect it in order to make informed pricing decisions. Previous Previous post: Freddie Mac sees strong apartment rental growth next five years in valuation report. Next Next post: Apartment building owners benefit from prime renter group ‘unbundling’, driving rents and occupancy.